Place the spinach and basil in the bowl of the food processor and process to chop coarsely. Add broth, garlic cloves and pine nuts. Process. Add the soy Parmesan, nutritional yeast, and tamari. process until well mixed. 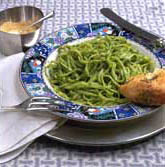 Cook pasta according to package directions, drain, and toss with pesto. Serve immediately.